Just back from his first European tour, Chet Baker spent the last week of July 1956 in a marathon recording session at L.A.'s Forum Theatre. A series of different sidemen came and went, and tracks recorded in these sessions ended up in several different albums such as Chet Baker and Crew, Chet Baker Sings and The Route with Art Pepper. This album, originally released by Crown Records, includes five tracks featuring the "Crew" (Phil Urso, Bobby Timmons, Jimmy Bond and Peter Littman), and "The Route" with Art Pepper and Richie Kamuca. Some of the tracks are the same as those included in other albums listed above, but notably, "Halema" is an unedited version and longer than the one released on Chet Baker and Crew. Baker was in an absolutely top form in these dates, and his trumpet playing is brilliant, lyrical, creative and swinging. 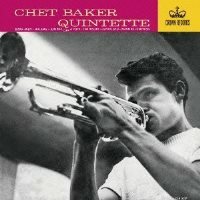 This is a great CD for fans of Chet Baker! Recorded at Forum Theatre, Los Angeles, on July 24 (Tracks 1 and 3), 26 (Track 4), and 31 (Tracks 2, 5 and 6), 1956.